Washington's Festival Park may look like a scenic and quiet natural park during a typical day in the downtown area, but the park comes to life regularly with an assortment of movies, concerts and festivals that have put the small town of Washington on the map. 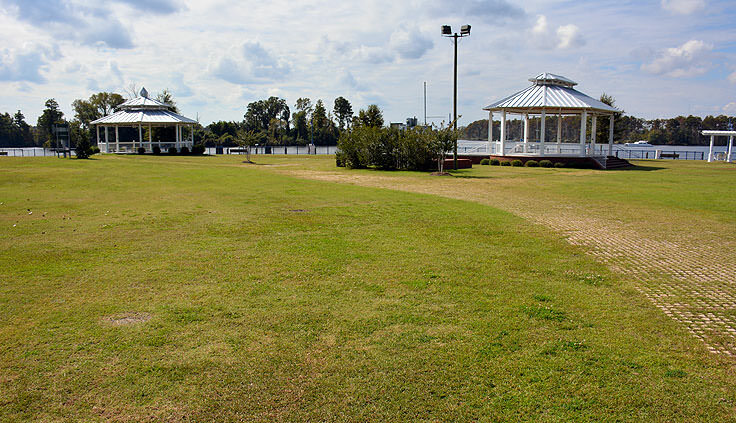 The Festival Park is a sprawling grassy locale next to the Pamlico Waterfront in the heart of Little Washington's downtown. Bordering the North Carolina Estuarium and a line of eclectic shops and restaurants, when not in use for a special event, the park serves as a quiet respite to take a stroll or enjoy an afternoon or sunset over the water. An Adirondack swing set provides a comfy resting area for busy Washington visitors who need a break, and a nautical themed play area allows children to burn up a little energy while enjoying the busy waterfront scene. 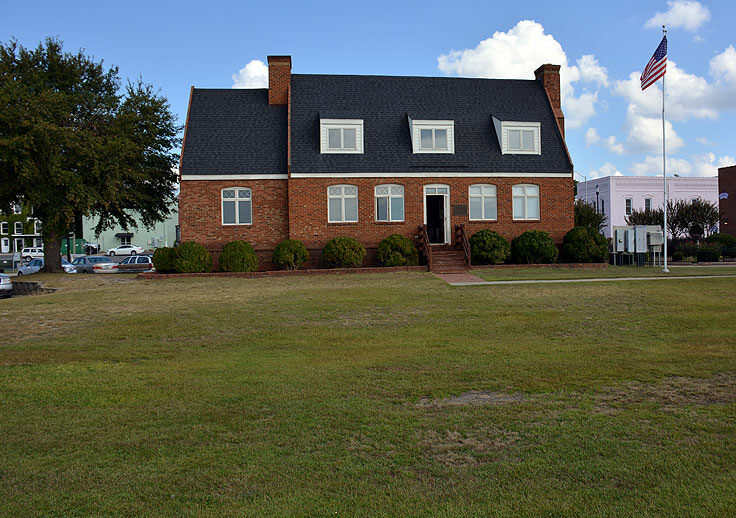 Even if a show or event isn't being held, the long grassy stretch of waterfront land is a perfect spot for a quick visit, as the park overlooks the downtown, the busy docks that lie just offshore, and the action of boats churning in and out of the Pamlico River. There's also a picnic shelter on site for easy outdoor meals with a fantastic view. 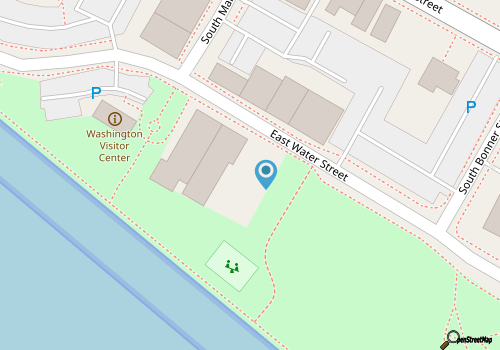 That being said, the main goal of the Festival Park is to provide a safe and large venue for Washington's many festivals, outdoor concerts, and other events held throughout the year, particularly in the summer season. Visitors are advised to check out Washington's town calendar of events, found online to see what new surprises and attractions will call the Festival Park a temporary home. Popular past events include an annual summer concert performed by the North Carolina Symphony, (usually held in June), all-day music festivals with bands and performers from all across the region, and an exceptionally popular BBQ festival which features dozens of vendors serving up Eastern Carolina's signature dish. Perhaps the most popular event held at the Washington Festival Park is the annual Summer Music Festival, which attracts 25,000 people annually to Washington's small downtown. During this event, patrons can enjoy a sprawling street fair with food, arts and crafts vendors, a kids' zone with children's activities, and free concerts throughout the day-long festival. Rides, games, and other activities are set up on the park's grounds in the evening, and the event is often capped off with a spectacular fireworks display over the Pamlico River waterfront. Admission is free to the public for the Summer Music Festival, in addition to the majority of outdoor concerts and events, (including the all-day music festival and annual NC Symphony concert), and visitors will find ample outdoor seating around the outdoor performance stage. Attendees are advised to bring their own chairs and blankets and arrive early to find a cozy spot that's close to the action, as all outdoor seating is available on a first come, first serve basis. Visitors should be advised that while the covered stage generally allows musicians and bands to perform in slightly inclement weather, because the rest of the site is outdoors, major events can be cancelled or postponed on exceptionally rainy days. Because the Festival Park is wide open, the public is welcome to visit the spot at any time, and simply enjoy the views and the slightly salty air. However, as any Washington local will tell you, the best time to visit this site is when there's music or the sweet smell of barbecue in the air, and with so many events occurring frequently throughout the spring, summer, and fall seasons, virtually any long weekend is a great time to check out the fairs, festivals and performances held regularly at Washington's Festival Park.